On July 14, 1865, British engraver-turned-climber Edward Whymper achieved the supposedly impossible. He reached the summit of the Matterhorn - perhaps the most familiar mountain in the Swiss Alps. The 14,700-foot mountain, which lies on the border between Switzerland and Italy had, until then, been regarded as unclimbable. Whymper himself had tried to scale it from the Italian side six times, and failed. 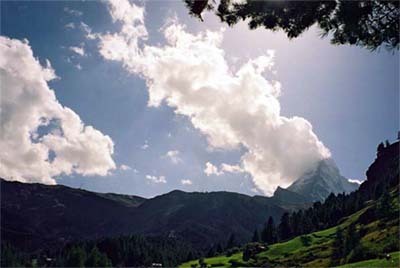 He was then determined to ascend from Zermatt (a village located at the base of the Matterhorn on the Swiss side), convinced that the dangerous appearance from that side was an optical illusion and that the continuous overhangs on the Italian side should make the Zermatt side a veritable staircase. This time, he succeeded. His triumph was tainted almost immediately by tragedy. On the descent, four of Whymper's companions fell to their deaths after one of the party slipped and a climbing rope broke, leaving only Whymper and two Swiss guides to tell the tale. The accident was to haunt Whymper for the rest of his days and unleashed outrage in the press, which condemned what it regarded as gratuitous loss of life. "Is it life? Is it duty? Is it commonsense? Is it allowable? Is it not wrong?" demanded The Times. These questions of morality aside, this potent mix of triumph and tragedy helped guarantee that the tiny village of Zermatt would lure visitors forever more. And the graceful pyramid towers of the Matterhorn were ensured a place in mountaineering legends. The mountain has four faces, with the north and south faces meeting to form a short ridge on top. Three days after Whymper's ascent, Jean-Antoine Carrel and his party reached the summit from the Italian side - a less celebrated story. Only six years after Whymper's climb, the bespectacled, well-read Lucy Walker became, in 1871, the first woman to climb the Matterhorn. Like Whymper and many others of the 19th century explorers of the Swiss Alps, she was British. The women pioneers had to be even tougher than the men. They faced ostracism for flouting Victorian notions of propriety, as well as the inconvenience of trying to scramble up mountains in skirts. Some dared to wear riding breaches, replacing them with skirts as the occasion demanded. Should they fail to put their skirts back on once they completed the descent, they faced the prospect of punishment by stoning. In the 19th century, Zermatt developed as a mountaineering center, where a very small number of brave female and male adventurers travelled to scale the Matterhorn. Today, though, it has become one of the world's most highly-rated skiing resorts. 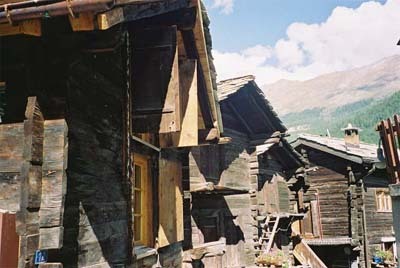 The rich details of Zermatt's development as a mountain center are depicted in Zermatt's Alpine Museum. In a homely, shed-like building, it exhibits the rope that broke during Whymper's descent, along with other climbing equipment, letters and photographs. The flora and fauna that survive the biting winters and thrive in the lush, green summer months are also well-documented. Just next to the museum lies the churchyard of Zermatt's English Church. Since the tragedy of 1865, the mountain has claimed many more victims, some of whom are buried in the churchyard, with gravestones marking the resting places of young men and women who lie far from their homes. Reaching Zermatt, though, remains almost as much of a challenge as scaling the Matterhorn. No cars are allowed in Zermatt itself. 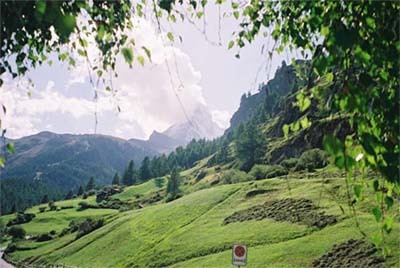 Visitors can take a train from the town of Brig on the river Rhone or from Visp at the entrance to the valley that leads to Zermatt. Alternatively, they can drive along a winding, spectacularly scenic road as far as Tasch and leave their car in a prosaic, sprawling car park. From there, there is the choice of a steep train ride up the mountain or one of the taxis licensed to drive you to the village. In summer, you'll return some time later to find your steering wheel melting in the heat. In winter, your car may well be submerged under a foot of snow and you'll have to dig it out. A covered, multi-storeyed car park is under construction, though. Within Zermatt, the only modes of transport are horse-drawn carriages and electric taxis that will whisk you from the station to your accommodation. Many hotels pick their guests up free of charge. If they don't, taxi fares are pricey. Some of the rare critics of Zermatt also complain about electric taxis buzzing about destroying the Alpine peace. We stayed at the three-star chalet-style Hotel Biner and were delighted with it. Swiss Franc (CHF) 100 a night (US $1= 1.18520 CHF) - tariffs vary slightly from season to season and cheap deals are available on the web - bought a sizeable room with en suite bathroom and use of a whirlpool, swimming pool, and a superlative steam room, complete with a show of different-colored, soothing lights. After you've been lulled by all this into utter calm and your muscles have recovered from the rigours of the slopes, you're probably ready for dinner in the hotel's restaurant, which serves wholesome, organic food. If this is not good enough for you, Zermatt has a huge choice of restaurants. One guidebook talks of a visitor who had been coming to Zermatt for 20 years only to eat at its unique mountain restaurants. Wherever you dine or stay in Zermatt, you have access to exceptional conditions for advanced and intermediate skiers and view after view of the majestic Matterhorn as you wind down the slopes. You can also ski over the border into Italy. For non-skiers and skiers alike, a cog-wheel train from Zermatt - or a five-hour walk - to Gornergrat, home of Switzerland's highest open-air train station, opens up still more views of Matterhorn's hewn-looking rock. For the truly decadent and seriously rich, panoramic helicopter trips are also available. Apart from the brooding presence of the Matterhorn, summer and winter visitors alike are drawn back again and again by the fact that Zermatt remains unspoilt when compared with the huge, purpose-built mountain resorts. There is some modern development, though. Glitzy boutiques selling Swiss Army watches, Swiss Army knives and designer ski-ware line the main street from the station. These coexist comfortably with the traditional, wooden, ramshackle homes and barns that stand on concrete mushrooms to prevent rodents from stealing precious winter stores. They date back to a simpler way of life and survival in the mountains, predating the time when Whymper stared up at the then-unconquered Matterhorn.